An alternative Review to the Raspberry Pi. A few issues ago I recounted the latter stages of my journey into computer and files based playback; the article discussed equipment from Ciunas Audio and the Raspberry Pi with the Allo DigiOne S/PDIF board. Aside from the excellent results from the Ciunas equipment I found the Pi with DigiOne to get very close to the sound quality of my fanless PC with my favoured Nontallion player. Of course I couldn't leave it there. What could I try next on a sane budget to finally match or exceed my muscular PC? Enter the Allo USBridge. This is based on the Allo Sparky single board computer (SBC) which has the same form factor as the Raspberry Pi; in detail it's quite different to the Pi. Sparky uses an ARM Cortex A9 quad core processor running at 1.1GHz, it has 1GB of DDR3L RAM. 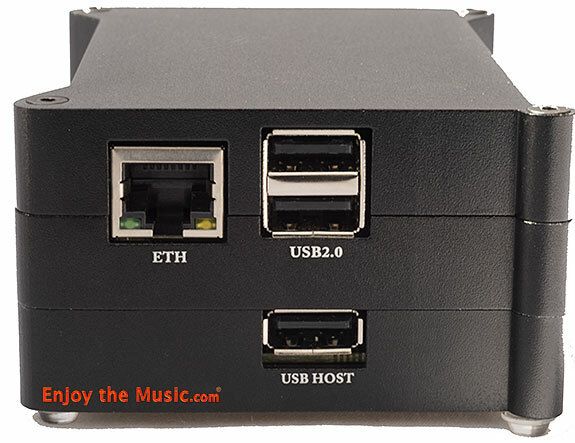 There's on-board Ethernet, HDMI, USB3 and USB2 ports. There's no Wi-Fi, you'll need a dongle if you want Wi-Fi – the idea is to minimize RF inference so wired Ethernet is preferred. The board has a 40 pin connector of the same type as used with the Pi for "HAT" add-on boards. Storage and operating system loading is via either MicroSD (up to 32GB) or EMMC (up to 64GB). Linux and Android are supported. The USBridge is a package of the Sparky SBC, a hyper low-noise USB board with re-clocking packaged in an aluminum case. The USBridge can be ordered pre-configured with either Diet-Pi or Volumio. The more intrepid with likely go for Diet-Pi as this Allows those with Linux expertise to try out various playback software. I like a simple life so I plumped for Volumio which also Allowed me to make more direct comparisons to my Pi setup. The well-made case for USBridge is several steps up from most SBC cases which are often Perspex. The aluminum case acts is a heatsink and shields RF thereby reducing unwanted transmission to nearby kit. In my previous article I was using Wi-Fi on the Pi with music files sourced from a directly connected USB disk. With USBridge I wasn't going to use Wi-Fi, even though I could use a dongle but why would I when the idea is to reduce RF interference? The USBridge was the product to make me finally run a long Ethernet cable from my router through a floor and a wall into my listening room. This cable feeds an Ethernet Switch which connects to both my fanless Windows media server and to either the Pi or USBridge. Such that I could establish a benchmark I connected up the Pi 3 to Ethernet and immediately heard a small but noticeable improvement, some would say more analogue or refined sounding. There was a little more composure being exhibited. Next I setup my fanless PC to be a media server ie as Network Attached Storage (NAS); I setup my music directories to be available to the Pi and USBridge. Initially with the Pi I heard a more refined sound when music was played via Ethernet versus the USB drive some might prefer the added sparkle of a directly connected USB drive but I felt the USB drive was a little brash sounding in comparison to Ethernet. I expect the difference stems from Ethernet having isolation as a standard feature. I should mention that my Pi now resides in a very well made aluminum case from Allo. Its funky looking with bouncy vibration absorbing feet, the case acts as a heatsink via a clever metal web that sit between the Pi and DigiOne. 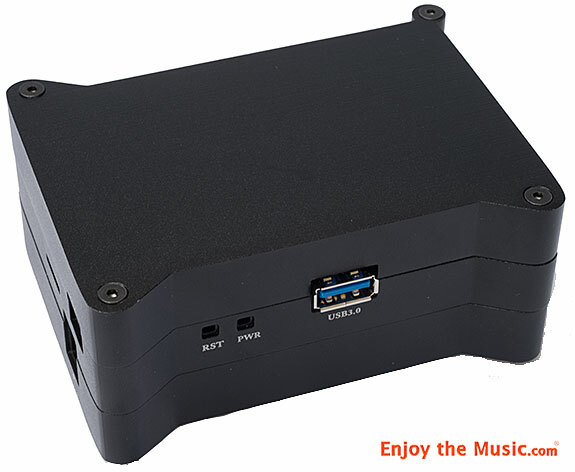 Maybe this case will especially suit those who apply special feet and weights to the Pi to damp vibrations. Time now to unleash the USBridge, how would it rate vs the Pi and my PC running Nontallion? The USBridge was connected via Ethernet and running Volumio feeding into my Metrum Musette DAC. I immediately had music playing with no fuss or bother. But then....I connected up the Ciunas Audio ISO-DAC and hit trouble; Volumio would not recognise the DAC. Mea Culpa, I really should have followed the instructions included with the USBridge. I was using the wrong USB socket in the USBridge; there are 4 to choose from. The correct USB socket is labeled "USB Host". I should keep quiet about my fallibilities but there's something cathartic about admitting to them. I wanted to further compare with the Pi / DigiOne at this point; this of course needed to be S/PDIF into the Metrum Musette. I now set up-sampling to 24/88.4 with "very high" quality. Against the USBridge I felt the Pi possessed a slightly less realistic or "you are there" mid-range, less depth and with the central image being more forward. At it first sounded as if there was some extra detail but on further listening it sounded forced and marginally "tizzy".... Please bear in mind this is all relative. The Pi was still was very good sound, I'm splitting hairs; you'll need a pretty decent system to hear the differences. For this trial and much of my listening I was using Bastanis Sagarmatha open baffle speakers though unlike the review of the Solo I was using the Duo version, these were driven by Temple Audio class D monoblocks, sometimes a vintage Phillips Black Tulip 100W solid-state power amp and at other times an EL84 SE amplifier. I like to ring the changes. Moving back to the USBridge, this time USB was used into Metrum Musette up-sampling 24/88.4. I now heard greater depth, resolution was good, there was with better defined placement and greater separation between instruments. This is a genuinely high quality sound. Swapping to ISO-DAC brought yet more life, detail and dynamics – possibly in part due the extra level of reclocking/reformatting & isolation. But we still aren't finished! One area where the USBridge differs from the Pi is that it's possible to easily run it with dual power supplies. All that's required for dual power supply operation is the removal of a jumper and of course a suitable second power supply. I started out with my Ordo linear power supply hooked up to the Sparky SBC via its microUSB connection. The Ordo is decent enough linear power supply with variable voltage. I believe it to be similar to a power supply more widely sold under the Muse brand. The USB card was powered by the superior Sbooster linear power supply so this meant that I had the better linear power supply working on the more critical USB electronics. I was to later find that the power supply for the Sparky SBC isn't too critical as long as it can deliver enough current. Whereas the USB power supply certainly does matter. Now onto to what I heard with the dual power supplies. My very initial impression was of a more forceful and dynamic sound. I then settled into listening to a couple of tracks (Chet Atkins & Mark Knopfler / There'll Be Some Changes Made; Oscar Peterson/ You Look Good To Me) I realised there had been quite a fundamental improvement with the dual power supply. Yes the sound was bolder, more dynamic and importantly I could more easily follow each individual musical strand or instrument. If I wanted to focus on the drums, piano, guitar, vocals whichever I could chose which of these would lead the track. I could focus on a single instrument in isolation or listen to the piece as a whole. I could even go with the hi-hats to drive along the music, the hi-hats in particular sounded significantly cleaner into the bargain. Bass developed a more natural acoustic around it too. The improvement from a casual listening perspective wasn't significant but from a "sit down and listen to a piece of music" perspective the improvement is much more meaningful. For me the big test was versus my fanless PC running the Japanese Nontallion playback software. In terms a bass quality there little to choose between the two setups. USBridge / Volumio is certainly on a par in the mid and treble and arguably ahead, especially so where central focus is concerned. USBridge also achieves the impressive depth of sound that Nontallion possesses. As for the pain of waiting for Nontallion and music files to load for several minutes at a time...well I'm converted now to USBridge and Volumio. The slightly greater musical alacrity in the mid and treble is important for myself and as for usability; USBridge and Volumio knock it out of the court in comparison to Nontallion. Where to store your files. I earlier established with the Pi that I preferred the sound of my music being served from a Windows Share and presumably a dedicated NAS would be much the same. I next wanted to run through a few options for files playback with the USBridge. I compared the Windows Share of my SSD, a USB3 hard disk drive, a USB stick and an SD card. Thursday's Child won't be widely known, this is English folk music with modern or recently modern issues being vocalized. The lyrics of When The Coffins Come Home are about returning British troops who were killed in action in Afghanistan. It's incredibly poignant and really hard not to shed a tear or two. On a lighter note is Voyager, this is about the Voyager spacecraft. There aren't many folk songs about space missions! This music was useful to help me understand how well the natural and unadulterated acoustic was maintained. Paris Londres are a two-piece band not surprisingly from Paris and London. I came across Paris Londres playing in Sarlat-Le Canéda in France and bought a couple of their CDs not expecting much in the way of production. The music is delightful, summery and happy; production is pretty much as good as it gets. The album Promesse is my favorite though they have recorded more recent work that I've not heard yet. With A Sarlat any change in the positioning front-to-back positioning of the vocals was very apparent as was the detail in the bass. First up is the Windows Share / NAS vs USB3 drive – the USB drive music sounded a little aggressive. You say the Windows Share sound with the USBridge is "relaxed", for me it's "composed" though some may prefer the more pushy sound of the USB drive but personally I don't believe it's as high fidelity. Next was the Windows Share / NAS versus USB mounted SD card – the SD card bass not as powerful or textured as with the Ethernet based Windows Share. On some tracks (e.g. Paris Londres A Sarlat) the soundstage moved back about 50cms, with Oscar Peterson You Look Good To Me the double bass lost its natural acoustic when played via the SD card. Overall though the sound was closer to the Windows Share than my USB hard drive, no "aggression" was encountered. The final contenders were USB stick versus SD – SD is better; the USB stick was a little recessed. Bear in mind that USB sticks in particular will have a great many different memory implementations so you could spend your life comparing USB sticks, if that's something you'd enjoy. For myself, the Windows Share has the most powerful and confident sound of all. All are good in isolation but the differences on some tracks are easy to spot when doing an A/B comparison. Don't take my findings as gospel; try out a few configurations yourself. This is all about transmitted noise in my opinion. I believe the USBridge will always just edge the Pi. Whether a NAS or Windows Share will better a USB drive will depend on the exact hardware you use but bear in mind that Ethernet has isolation built-in whereas USB does not. Your preference will also depend on what type of sound works best in your system, ie forward or relaxed and of course your other personal preferences very much come into this. Battery – Is Off-Grid Electricity Worthwhile? One of the more civilized hi-fi forums had an interesting idea for powering digital equipment. 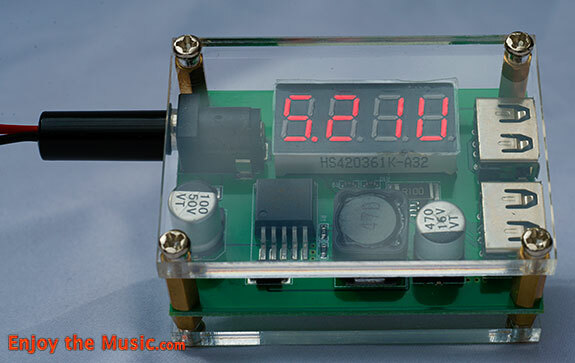 The suggestion is to use a Lead Acid battery with the interesting part being to use a very low-cost DC-to-DC converter. The converters (there are many options) are available on eBay from China for next to nothing, about $5 each. I wasn't convinced but the two guys suggesting this are dependable with good ears. I ordered two DC-to-DC converters from China and forgot about them until they turned up around three weeks later. I set up the two 12V-24V to 5V converters each powered by 12V Lead Acid 7Ahr batteries into the USBridge. This gave an even more powerful and dynamic sound than I'd already enjoyed with the linear power supplies. There was also more detail to some bass-lines. On A Salat I could hear two individual notes from the bass guitar when previously it had been a single homogenized note. I then tried swapping the power supply for Sparky to be the standard SMPS and retained the Lead Acid battery and 12V to 24V @ 5V converter for the USB board. This gave the same improved dynamics I'd just experienced but not the individual bass notes so dual battery / converter power supplies won the shoot-out. I must add that these differences were relativity minor and only apparent as I have a very good bass sub-system, plus only with certain tracks could I identify these differences. Quite what interactions are at play I cannot say but this final configuration is low-cost and high-performance if a little bit of a hassle due to it being battery. I've ended up supplying Sparky with 2 x 7Ahr batteries in parallel with a single 7Ahr on the USB card, this is because Sparky is the more power hungry board. I'll never reach journey's end whilst I'm breathing but this latest part of the files based playback journey has turned up some interesting options. What can be achieved with minimal outlay and some experimentation is outstanding. Of course the Pi and USBridge are not restricted to playing stored music files, internet radio and streaming services such as Spotify are available depending on the software you use. The Pi / DigiOne into S/PDIF will suit a great many people. 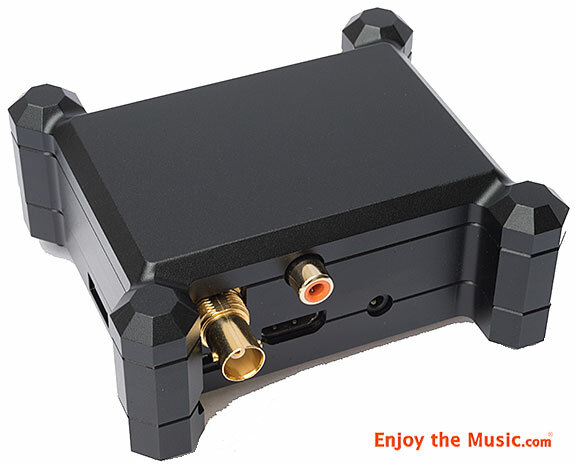 The USBridge with a USB DAC will also suit many people and for me it comes out just that important bit ahead. I felt the aluminum case for the Pi / DigiOne brought a little added composure to its sound. If I were to compare characters with vinyl playback I would position the USBridge as being more aligned with the character of my London Reference cartridge whereas the Pi / DigiOne is more a Grado or lower-end Koetsu character. What I'm getting at is that the USBridge has greater resolution, superior soundstaging and dynamics; the Pi / DigiOne is arguably more organic or meaty sounding, less resolving but still very enjoyable. Ultimately I'd suggest that choosing between Pi / DigiOne and USBridge is best dictated by the capability of your DAC. If you only have S/PDIF for an input then get the Pi / DigiOne and don't fret. 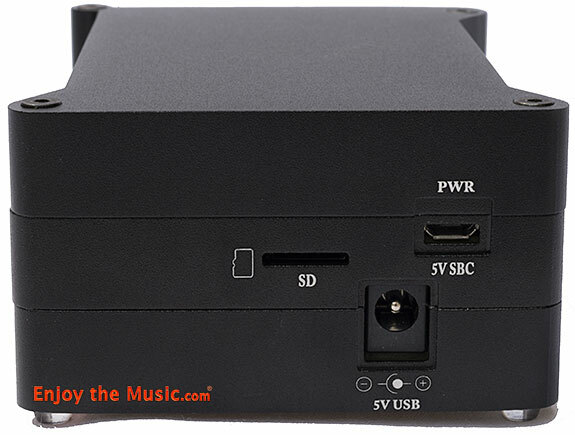 If you have a USB DAC then USBridge can perform at a slightly higher level. Then you just need to decide how to serve the computer with music files and how to power the audio computer (USBridge or Pi / DigiOne). Hopefully this article has given you some ideas for comparisons you can make at home easily such that you can choose the best route for your setup and ears. Available in Clear and Black, and your choice of Black or Silver Standoffs.